Winston-Salem is a city in and the county seat of Forsyth County, North Carolina, United States. Start off your visit on the 16th (Mon): explore the different monuments and memorials at God's Acre, contemplate the long history of Wait Chapel, and then take in the awesome beauty at Hanging Rock State Park. Here are some ideas for day two: contemplate the long history of Old Salem Museums & Gardens, get curious at Greensboro Science Center, and then examine the collection at International Civil Rights Center & Museum. To find maps, reviews, photos, and other tourist information, read Winston Salem trip planner . Charlotte to Winston Salem is an approximately 1.5-hour car ride. You can also take a bus. September in Winston Salem sees daily highs of 80°F and lows of 63°F at night. Finish up your sightseeing early on the 17th (Tue) so you can go by car to Jacksonville. The sprawling city of Jacksonville is not only Florida's most populous city, but also the largest city by land area in the continental United States. Explore Jacksonville's surroundings by going to St. Augustine (St. Augustine Lighthouse & Maritime Museum, Inc., Flagler College, & more) and St. Augustine Beach (in Saint Augustine Beach). There's lots more to do: meet the residents at Jacksonville Zoo & Gardens, let little ones run wild at Ed Austin Regional Park, and take in the architecture and atmosphere at Basilica of the Immaculate Conception. To find other places to visit, where to stay, maps, and tourist information, read Jacksonville trip itinerary builder app . Getting from Winston Salem to Jacksonville by car takes about 8 hours. Other options: do a combination of bus and train; or take a bus. Expect a bit warmer temperatures when traveling from Winston Salem in September; daily highs in Jacksonville reach 87°F and lows reach 70°F. 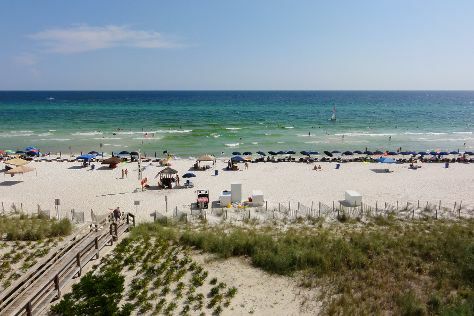 Finish up your sightseeing early on the 20th (Fri) so you can go by car to Panama City Beach. Boasting 43 km (27 mi) of white sandy beaches and plenty of sunshine, Panama City Beach is an ideal choice for a relaxing holiday. On the 21st (Sat), do a tasting at Panama City Beach Winery, see majestic marine mammals with a dolphin and whale watching tour, and then get close to the beloved marine mammals with a swim-with-the-dolphins experience. On the next day, admire the natural beauty at Gulf World Marine Park, then browse the different shops at Pier Park, and then enjoy the sand and surf at Panama City Beach. Use Inspirock's suggestions to plan your Panama City Beach trip and find the best activities and attractions for your vacation. Traveling by car from Jacksonville to Panama City Beach takes 5 hours. Expect a daytime high around 89°F in September, and nighttime lows around 70°F. Cap off your sightseeing on the 22nd (Sun) early enough to travel back home.